With Valentine's Day almost upon us, it is time to start thinking about gifts. 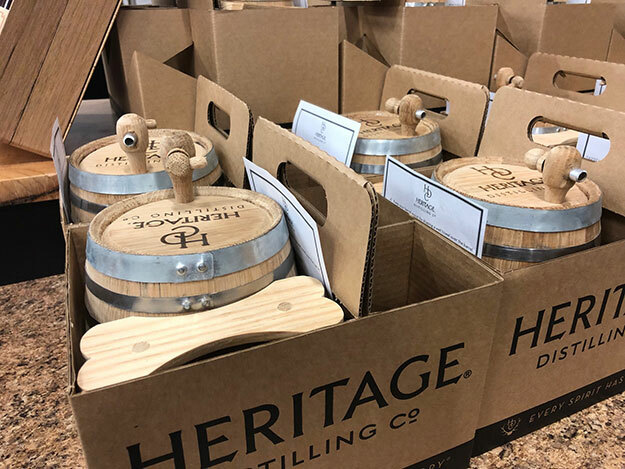 Typically one looks to a nice dinner, or flowers and chocolate, but this year, think outside the box and visit the Heritage Distilling Company (HDC) for one of their My Batch Classes. During this three-hour educational experience, you will learn about the distilling process from beginning to end. It makes a perfect gift for anyone who appreciates the craft beverage process. Your class begins upon your arrival at the HDC Flagship location in Gig Harbor. After a brief introduction, and signing paperwork that makes you a distiller for the day, the fun begins. The company's master distillers start the stills and begin a class on distillation and the history of the company. You learn how the stills operate, and get an opportunity to view the process up close, to include finger samples. Even though we had a large group, the class was very friendly, and people felt comfortable enough to participate and ask questions. Once the class portion is over, you will break into three groups to rotate through the next three sections. First up, try some hors d'oeuvres, which are a tasty snack about halfway through the event. Next, a full distillery tour, which shows how the mash is made, the different types of grain used and the bottling line. Finally, you will head upstairs to the tasting room to try some HDC Bourbon and Rye Whiskey. You have the opportunity to try four half-ounce samples, two of Rye and two of Bourbon. The tasting is always fun, and allows you to compare the subtle taste differences. Once everyone has finished the three rotations, you meet back up by the stills to learn about proofing. The master distillers then give you instructions on how to bottle the whiskey. When you are finished bottling the whiskey, you will be given an American Oak mini cask to take home to age your whiskey. Unlike the large casks that HDC whiskey is aged in for a couple of years, the small cask will age your take-home whiskey in two to six months. It is up to you to determine the aging based on taste tests at home. HDC currently has two Bourbon and Rye Whiskey My Batch dates scheduled for Feb. 16 and March 23. The $149 class fee includes the class, a whiskey tasting, hors d'oeuvres, and two bottles of unaged spirits and a barrel to age them in. You will have a choice of making Bourbon or Rye whiskey. Insider Tip: At the class, you could purchase additional bottles of the unaged whiskey for $15 a bottle. This is a great deal as aged bottles of HDC spirits are priced from $35-$55 a bottle. Everyone also receives a 20 percent discount on any HDC merchandise or spirits purchased at the end of the My Batch Class. HDC supports Special Forces charities through its sale of Special Forces Bourbon and they also offer a 20 percent military discount in their shops.